Research tells us that there is no greater school-related impact on student learning than a teacher in the classroom. The second greatest school-related impact on student learning is school leader effectiveness. This research has implications for how school leaders support teacher growth and feedback and focus the work of pedagogical leadership teams on learning. The objectives of this institute are to clearly define what 21st Century learning looks like and identify concrete ways in which a pedagogical leadership team can support learning. School leaders will walk away with three key levers to promote critical thinking, problem solving and a joy for learning and bring about instructional change and improvement that they can implement in their schools immediately after the session. This session will involve an update on the enhancements to the IB Primary Years Programme. It will give you an opportunity to meet members of the PYP team and gain a better understanding of the programme. We will delve deeply into the new organizing structure of programme; The Learner, Learning and Teaching, and the Learning Community and highlight particular areas. You will have the opportunity to engage with new teacher support materials and reflect on their relevance to your context. Key qualities that transform a meeting into a learning conversation. How to choose and use protocols to support professional learning. How protocols can be used in an ongoing collaborative inquiry process. Facilitation strategies for leading such conversations effectively. 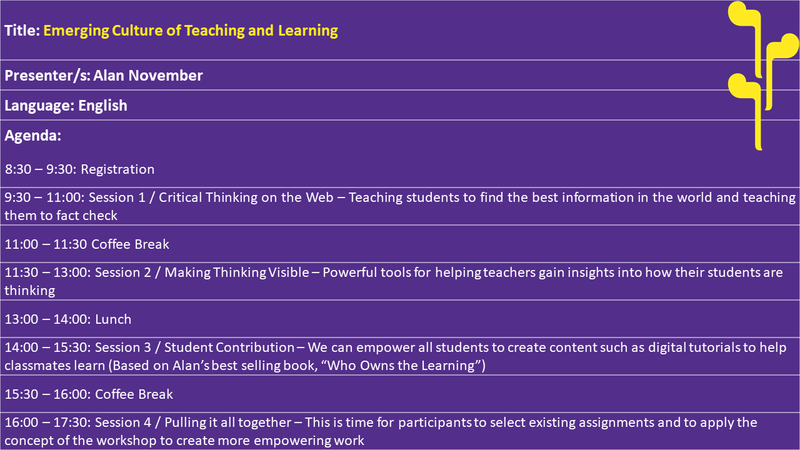 While the focus throughout the workshop will be on the creation of powerful learning conversations for teachers and administrators, we will also address briefly how these same tools and strategies might be applied, with modifications, to support student learning in the classroom. 3 - Learning that matters! The participants will develop an understanding of what authentic learning is and what does it look like in the Early Childhood classroom. Teachers play a major role in creating classroom environments that invite experiential learning opportunities that support real-life experience inside and outside of the classroom. This approach necessitates planning and reflection that targets the connection between subjects. 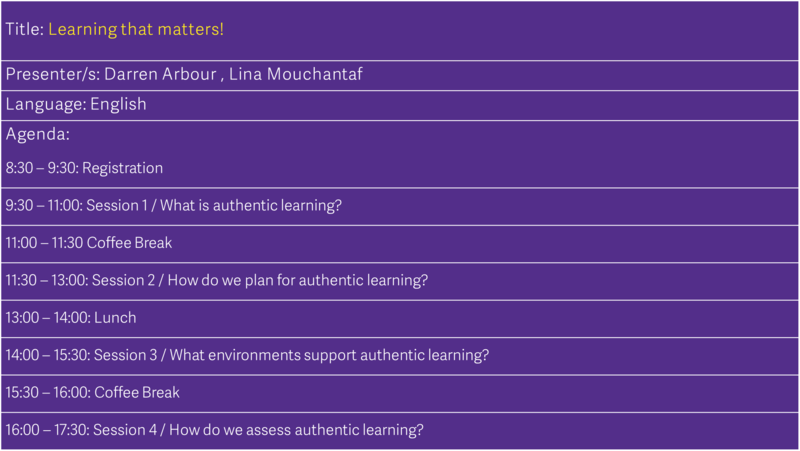 Participants will also explore the assessment tools and strategies most relevant to authentic learning. This exciting and interactive session will have participants experience authentic learning and take away strategies and understanding that they may apply in their own classrooms. تهدف الورشة الى تمكين المشاركين من استخدام الدراما كوسيلة مبدعة وخلاقة لتحقيق أغراض تعليمية بطريقة تطبيقية ممتعة ومفيدة من خلال استخدامهم نماذج عملية عن الصور الثابتة والارتجال ولعب الادوار. During this session computing specialists from London Connected Learning Centre will explain how a new curriculum subject, computing, has changed teaching and learning in English primary schools. Participants will take part in hands on activities which allow them to practice their computational thinking skills. The session will include a range of classroom-ready activities which can be used to support children’s learning across the curriculum. Over the course of the day we will look at various aspects of the digital world and their impact on different areas of the ELT industry. 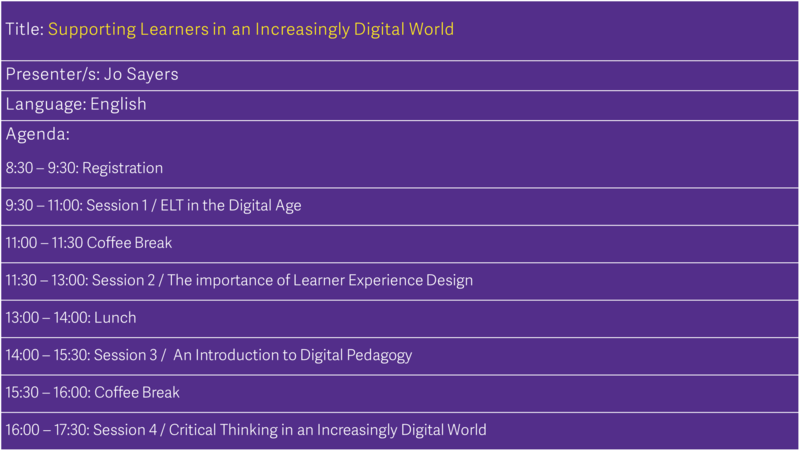 This will include sessions looking at general technology trends, approaches and best practice in terms of product development, syllabus design and classroom practice, an in-depth look at digital pedagogy and practical tips on how we can best equip our learners to be global citizens in this digital world. 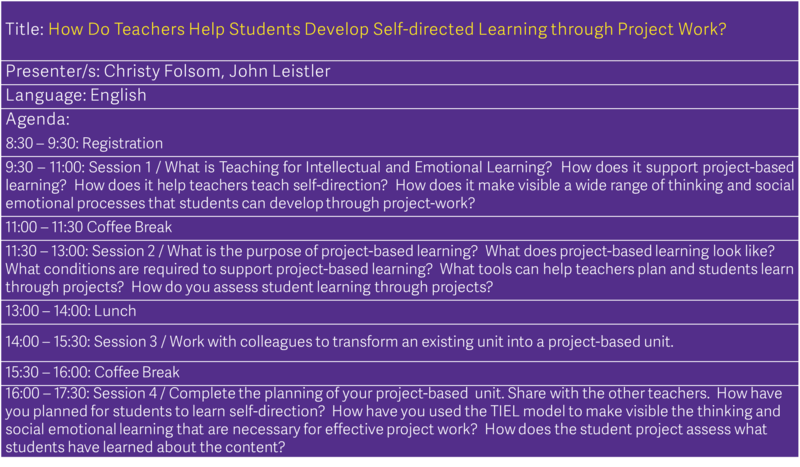 8 - How Do Teachers Help Students Develop Self-directed Learning through Project Work? Self-direction includes a set of skills that students can learn through project work. However, teachers must explicitly plan and teach students to set criteria, make decisions, plan, and self-evaluate their work. Teaching for Intellectual and Emotional Learning (TIEL) will provide a framework for teaching the thinking and social emotional skills that students develop through project work. For this session, teachers need to bring a unit that they would like to transform into a project-based unit or an idea for a new unit that can include a project that they can plan. Access to timely information and communication tools can empower educators to focus on the individual learning needs of their students. These same tools can lead to a wealth of benefits, such as greater collegiality, stronger relationships, self-directed students, curriculum-aligned technology, authentic work, rigorous and motivating assignments, and the development of a strong learning community. fearless learning. Thaka is a child education company that started in 2007 aiming at improving the lives of the young generation. Under the umbrella of Thaka Jordan is the brain development program UCMAS, that was started in 1993 in Malaysia and 2007 in Jordan and the entrepreneurship program JOE (Journey of Entrepreneurship), that was started in 2015 in Singapore and 2017 in Jordan. UCMAS utilizes the abacus mental arithmetic process as a training tool for the brain's concentration, imagination, memorization and other mental functions whereas JOE instils the entrepreneurial mindset, attitude and knowledge in the minds of the young learners. The future is mysterious for everyone but at Thaka Jordan we believe that changing our children's future depends on what we do today. That is why we embrace Thaka's slogan... The Future Starts NOW! Through this session we will look at the strategies, skills and attitudes that underpin approaches to teaching and learning from an IB’s perspective. • Understanding approaches to teaching and learning. • An overview of how teaching and learning are developed through the lens of an IB continuum of education. • An opportunity for participants to reflect on approaches to teaching and learning in their own school context. This practical interactive session will provide teachers with an opportunity to further develop effective classroom management techniques to support the learners of today. How do we deal with discipline challenges? How do you encourage group work that is productive and stimulating? And how do you facilitate student involvement in setting common agreements? Participants will learn how the practice of coaching is empowering, it develops autonomy and can lead to greater effectiveness both personally and professionally. Through practical activities colleagues should gain some insights into its benefits and uses. Come to this workshop prepared to take part in activities. Participants will gain specific strategies to develop meaningful relationships with their students by understanding the importance of fostering an attitude of empathy before criticism as well as counseling rather than discipline. In IB Programmes, sustained inquiry frames the written, taught and assessed curriculum. The emphasis is on Approaches to Learning (ATLs) in a contextual curriculum. Information Literacy and Media Literacy are specific ATLs that IB Librarians play a role in addressing. Using MYP: from Principles to Practice. Kathleen has been an educator for 20 years and a librarian for the past 8. Her interests include IB librarianship, librarian education and PLNs, and libraries as an extension of the classroom. Learn how the Supporting Teacher Effectiveness Project (STEP) is shifting traditional PLCs to communities where teachers become researchers of their practice and create a culture of innovation that supports measurable change. Implemented in several districts in the US and supported by the Bill & Melinda Gates Foundation, learn the approach that creates change based on “bright spots” – uncommon but successful behaviors or strategies that enable better solutions to shared challenges. Through a four-phase continuous improvement process that participants will be able to implement upon returning to their schools, STEP leads educators through each phase in following a natural learning progression towards improvement. It provides a structured yet nimble way to conduct PLCs that attends to the technical and social aspects of improvement, and ultimately helps answer that central question: How do we know when a change is an improvement? The visual arts is a very broad category of art. It is not only drawing, painting, photography, film, and sculpture, but also ceramics, interior design, and architecture. This workshop is designed to develop participants’ understanding of the visual arts as a valuable resource for learning and how to integrate them into a variety of classroom activities. The focus will be on painting and photographs. We are not trying to turn students into art experts, rather we would like to use the richness inherent in art to promote deep thinking by our students in general. The goal is to help students develop ways of thinking such as being curious and considering ideas from multiple perspectives. 1. the beliefs and behaviors, attitudes and interactions that form the fabric of life in our classrooms and in our schools. 2. the importance of learning from effective teachers. 3. the importance of modeling the behavior that they expect. IB values education more as the transformation of personal understanding and collaborative construction of meaning, and less as transmission of knowledge and rote memorization of facts. What Great Teachers Do Differently book by Dr. Todd Whitaker is focused on the same concept by discussing many ideas how to value the knowledge, the relations, understanding that when learning becomes meaningful and relevant, students are more likely to be engaged. 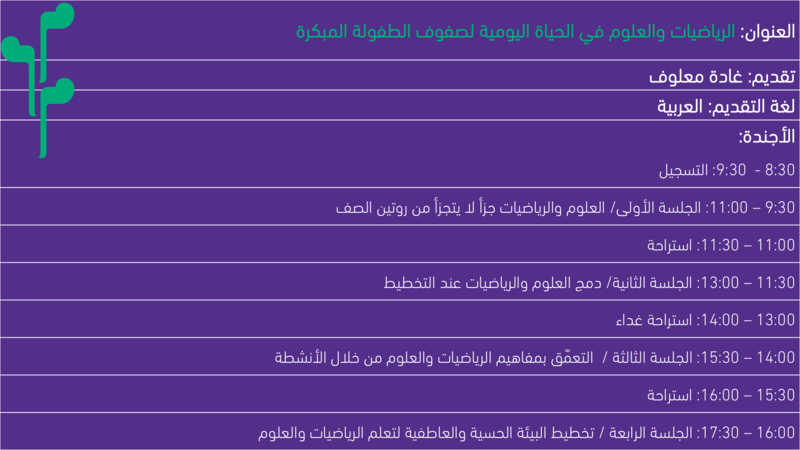 INJAZ has a platform to set up volunteer services in a more coordinated, systematic, and efficient manner. It offers effective means to engage volunteers in building their society and to spread a culture of volunteerism in Jordan. INJAZ already succeeded in institutionalizing volunteerism within the corporate social responsibility (CSR) programs, which have been already adopted by many of its over-300 private and public sector partners. INJAZ removes typical logistical and/or bureaucratic barriers to enable members of the private sector to work directly with the youth. This model has been developed in consultation with partners, which includes government officials and institutions, the private sector, educators, volunteers and students. looking at developing key skills and attributes for the future workplace. How can we develop these key skills/attributes in schools. Research indicates the most effective type of professional development is personalized instructional coaching. The purpose of this session is to provide an overview for instructional coaching including identifying high leverage areas of strength and growth as well as using questioning to promote self-reflection. The presentation will include training on one specific coaching model which participants can immediately utilize in their schools. Lastly, the session will analyze an example of coaching and debrief the areas of strength and growth as well as how the coach could improve. As machine learning and artificial intelligence technologies are being increasingly applied in every aspect of our daily lives, what will the implications be for how we discuss critical thinking and global citizenry? In this talk we look at the world outside of ELT to better understand the impact of these development on the skills our learners need now and those that are likely to be invaluable in the future. We then look at the potential impact on teaching and learning in our own industry, and what we can all do as educators to best equip our learners to be global citizens in this digital world. Attendees will learn how to use a variety of free formative assessment tools including kahoot, google forms, quizlet, and goformative. Attendees are requested to bring a device, such as a laptop or phone, so they may participate in this hands-on session. These formative assessment tools can be effectively utilised with a wide range of students, across a multitude of subjects. The issue of school underperformance is universal; educators all over the world wrestle with the problem of how to improve schools. Recent research by EdDevTrust, focusing on a particularly interesting group of English primary schools, shows how chronic weak school performance can be transformed, fast. 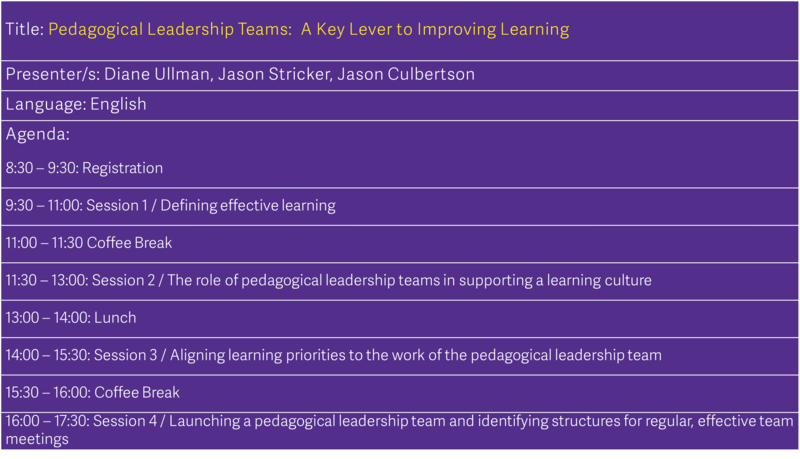 The session will share insights from the leaders of these schools and encourage discussion and debate about the lessons that may be transferable to other contexts. A claim is often made by national and international programmes alike for learning that contributes to the development of the whole person. The role of learning beyond the classroom will be explored in this session, with reference to learning arising from links with the community and from personal interaction between students. Examples will be drawn from research studies undertaken at the University of Bath and more widely. Participants will explore the idea of promoting and developing multilingualism in schools. We will look at ways in which schools have developed a variety of means to support multilingualism and how these might be implemented in their own schools. Participants will reflect on their own school experiences of multilingualism, learn from the experiences of other schools and draw up an action plan to explore within their own school context. This interactive session will explore the reciprocal relationship between good health and academic success and how quality health education programmes help students achieve their highest academic potential.This session will highlight how “health/well-being education” is situated within the broader context of holistic educational efforts globally, and in the International Baccalaureate. It will also discuss opportunities, implications for learning and challenges for schools. The session will be structured as an inquiry into the interdependence of culture and health education, and the consequences for social and emotional learning, human rights, equity and equality in education. Students who love writing are the one who feel like writers. Through video, examples, and activities, teachers will learn how to provide more freedom and choice in their writing time to facilitate classroom community, student confidence, and student passion for writing. Teachers will participate in a creative writing activity themselves and receive writing prompts for their own classrooms. By the end of the session, participants will have a better understanding of how drama can be a helpful tool for language learning/ teaching by introducing and exploring seven drama activities that can be used in the classroom. Participants will be better able to use drama techniques to enhance problem solving for teenagers. This will be done by presenting common issues that teenagers face and useful drama techniques/ activities to overcome the problem. Teachers will enjoy the communicative aspect of this session as they will participate actively in the proposed activities through group work. In the more than 60 years since ETS was founded, ETS has expanded its focus to include learners worldwide. Today, ETS is known for its commitment to sound research, advancing learning and increasing opportunities for teachers and students internationally.To advance quality and equity in education by providing fair and valid assessments, research and related services. Our products and services measure knowledge and skills, promote learning and educational performance, and support education and professional development for all people worldwide. This session will summarise support provided by the University of Bath to those with an interest in international education. In particular, the presentation will focus on the work of the Department of Education, and its interest in research relating to international education and the International Baccalaureate. Information will be provided about postgraduate qualifications with a focus on international education that are available for study on a part-time basis to teachers and leaders based at schools worldwide, including doctorates (the PhD and Doctor of Education, EdD) and the MA Education, which can be studied in conjunction with the requirement of the IB Educator Certificates. Effective research depends upon framing/asking valid questions in relation to the topic under investigation. This presentation will review the framing of questions and related methodologies which arise in relation to inquiries in an international and global context, drawing particularly on research undertaken at the University of Bath. Exhibitor Session: Follett’s Digital Resources: Fun Leaning @ your fingertips, anytime & anywhere. The Session will highlight Follett’s digital resources that enable teachers take their learning outside the classroom as well as encourage students to indulge in interactive learning experiences in an open virtual context. Assessing for 21st Century Skills: Looking for Evidence to Guide a School Toward 21st Century Learning. This session will help school leaders and teachers develop an understanding of how to look for evidence of 21st Century Skills. Built upon The Partnership for 21st Century Skills Framework, participants will practice looking for evidence of learning that goes beyond grades, tests, and external examinations. Through this workshop, attendees will be able to plan a unit through the Unit by Design framework, which requires backwards planning from standards and objectives to creative assessments and then to fun and engaging lessons. Attendees will also be able to implement digital tools that make formative assessment and classroom management easier than ever.Most curriculum planning often shows a list of activities with little sense of intended results and negligible attention to assessment evidence. This results in ineffective learning, as deep student engagement in learning requires content objectives to be thoughtfully combined with meaningful assessments and effective pedagogy. Today, young people are writing more than any previous generation, for a wider range of audiences than ever before. Much of their writing is for their own peer group and is often expressive writing – written- down speech. Through texting, messaging, email and blog posts, new categories of writing have emerged. This workshop will draw on examples from a small-scale Education Development Trust research project, based in London primary school classrooms, which set out to explore the differences between pupils’ digital writing on school blogs and their regular school writing. In this workshop teachers will explore questions about children becoming part of writing communities and the benefits of blogs having a ‘global audience’. Teachers will find out about key issues in blogging such as access to computers, online safety, the structure of blogs, and children’s engagement in writing. Good curriculum design explicitly connects areas of knowledge as well helps student make their own connections. But it's easier said than done! This session explores a theoretical perspective on which to base the development of interdisciplinary study, considers practical issues in school-level implementation of interdisciplinary learning, and looks at ways to assess students' ability to construct meaning across academic disciplines. 3- Create a flipped classroom. 1. The features of adolescence, puberty and adolescence, gender differences during this phase, psychosocial tasks of adolescents and identity formation. 2. The developmental characteristics of this phase, teacher adolescent relationship and the proper disciplinary techniques to employ with them. Neuroscience in the classroom: a new pedagogy? A critical consideration of how findings from neuroscience research and our knowledge of how the brain works can be applied in the classroom; distinguishing between appropriate and inappropriate applications; thinking through implications for our understanding of the processes of teaching and learning. The session will examine how new ideas relate to existing psychological theories of learning and will challenge some ‘neuromyths’. During this session, participants will have a hands-on experience of looking at literature from a different perspective. This perspective will lead to facilitate a stronger emphasis on writing, vocabulary and overall language use. Teaching has the power to provoke thought, give access to diverse worlds, and support children in all areas of their development. Literature is a powerful tool if we know how to use it! 1- the importance of investing the multiple intelligences in teaching and assessing Islamic Studies. 2- the importance of taking the students learning style into consideration while teaching and assessing. And how this reflects on elevating the students' achievement. Carolyn will explore why many teachers do not like traditional forms of assessments and also try and understand how assessments can have a value in supporting good learning and teaching. She will then consider how innovative new assessments, which capitalise on the opportunities offered by the use of rich media in an on-screen delivery, can provide many of the benefits of standardised assessments, whilst avoiding some of the most disliked features of many current public examinations. ستعمل كارولين على استكشاف الأسباب التي تجعل العديد من المعلمين لا يُحبّذون الأنماط التقليدية للتقييم، كما ستحاول فهم الأساليب التي من شأنها أن تعزز من قيمة التقييم في دعم الأنظمة الجديدة للتعلّم وأساليب التدريس. بعد ذلك، ستدرس كيف يمكن لأساليب التقييم الجديدة والمبتكرة الاستفادة من الفرص الناجمة عن استخدام وسائل الإعلام الغنية التي تعرض على الشاشة، وبالتالي تحقيق العديد من الفوائد المكتسبة من أنماط التقييم المعيارية، وفي الوقت ذاته تجنب عدد من أكثر الميزات التي لا يرغب بها مجموعة كبيرة من الجمهور الحالي للامتحانات. The medical professions place evidence at the heart of their understanding of professionalism. Is it possible for school teachers to do the same? How far can classroom teaching be a research-based activity? Tony will address these questions in this talk drawing upon the report he wrote in 2016: Teaching as Research-Informed Profession: Problems and Possibilities. He will review arguments both for and against the proposition that school teaching should aim to follow the ‘medical model’ and ensure that professional practice is guided by research evidence. He will explore some of the practical difficulties that busy classroom teachers face when they attempt to make use of research in their daily practice. Finally, Tony will argue for the need for teachers to use the best available evidence when collaborating together through professional learning communities. يتمحور فهم المتمرّسين والخبراء في القطاع الطبي لمفهوم الاحترافية في العمل حول عنصر جوهري وهو وجود الأدلة. فهل يمكن لمعلمي المدارس أن يقوموا بالشيء ذاته؟ إلى أي مدى يمكن أن يتحوّل التدريس في الغرفة الصفّية إلى نشاط يعتمد على الأبحاث؟ سيتطرق توني إلي هذه الأسئلة في حديثه معتمداً على التقرير الذي كتبه في عام 2016: التدريس كمهنة تعتمد على البحث: المشاكل والإمكانيات. وسيستعرض توني الحجج المؤيدة والمعارضة للاقتراح الذي يُفيد بأن التعليم المدرسي يجب أن يهدف إلى اتّباع "النموذج الطبي" وضرورة التأكد من أن الأدلة البحثية هي ما يجب أن يوجّه الممارسات المهنية. كما سيكشف الستار عن بعض الصعوبات العملية التي يواجهها المعلّمون في الغرف الصفّية المزدحمة عندما يحاولون الاستفادة من الأبحاث أثناء عملهم اليومي. وأخيراً، سيناقش توني ضرورة قيام المعلمين باستخدام أفضل الأدلة المتوفرة عندما يتعاونون معاً أثناء لقاءاتهم في مجتمعات المتمرّسين والخبراء في عملية التعلّم. BravoBravo is a fun application for learners and is a comprehensive assessment tool for schools, teachers and parents. It’s currently available for primary grades covering the subjects: Arabic Language and Mathematics. BravoBravo helps learners practice different skills while having fun. It nurtures the learners’ curiosity, appeals to their imagination and keeps them engaged with gaming elements. BravoBravo can seamlessly be woven into lesson plans and curricula and provides teachers with a bird’s eye view of a classroom’s performance and in-depth reports on individual learners. BravoBravo liberates around 500 hours of teachers’ time every scholastic year that is typically spent on writing assignments, developing worksheets, marking them and analyzing the results. Instead, automated assessment allows teachers to pinpoint the learner’s areas of strength and address their weaknesses. At the school-wide level, BravoBravo utilizes big data to increase efficiency and provide customized, data-driven, targeted, and effective reports. Additionally, it facilitates parents’ involvement in their children’s education by allowing them to oversee the student’s progress. هل هم مضطربون؟ أم أبناء مرحلتهم النمائية !! Participants will be aware that collaboration helps promote social skills and real-life skills that are used outside of the school. It also helps build character and keeps the classroom fun and engaging, as the students are exposed to various ideas and perspectives. Come to this workshop prepared to engage in discussion around the setting up of a Peer Coaching culture.Be prepared to bring ideas to the table and engage in activities. This session will review changes to DP subjects that are taking effect for first teaching in 2018, and preview changes that will take effect for first teaching in 2019 and beyond. • An understanding of how these changes will impact on teaching and learning. I don’t know how to do that using mathematics! n a problem-driven approach to teaching mathematics, problems are used to provoke responses from students and those responses reveal the mathematical concepts (e.g., basic operations etc.) that we want children to learn. 1. To explore the use of problems to develop mathematical knowledge and skills. 2. To reflect on the importance of making a shift from teaching mathematics as “the memorization of facts, rules and procedures use to produce an answer” to supporting students to experience mathematics as a “meaningful, sense-making problem solving activity"
This session will look at how to implement the IB’s Career related programme, the key strategic considerations, the programme structure, the practicalities of building a programme that fits your context and the possible pathways open to CP students. In medicine and healthcare, evidence-based practice has yielded enormous advances in patient outcome in the last 20-30 years. Applying similar approaches in education has the potential to transform schools and school leadership. In this session, participants will learn how evidence-based practice is being applied within an accreditation for Ministry of Education Supervisors who are supporting teachers of refugees across Jordan. The session will discuss the use of diagnostic lesson observation, research on teacher effectiveness, and evidence from the science of learning. The purpose of this workshop is to enhance participants' understanding of the importance of choice in the early years. An emphasis will be placed on defining choice and play in the early years. External assessment is an optional feature of the revised IB Middle Years Programme. On-screen examinations and ePortfolios have been developed for students and schools that desire a formal qualification for 16 year olds, as well as for schools seeking to strengthens the IB continuum. But eAssessment is also designed to improve teaching and learning in all. MYP schools. Come to hear the latest plans, share stories of success and ongoing issues, and discuss how eAssessment is helping to shape learning and teaching across the MYP community. 1. Understand the importance of mentoring among teachers. 2. Break the fear that if we share what we know with someone, they may take our job. 3. Be aware of the benefits of mentoring for students' growth. This model draws on the work of Colleen Cruz, Nancie Atwell, Lucy Calkins, and Kate & Maggie Roberts. The workshop model of teaching serves to instigate tangible growth in young readers and writers. The one-to-one aspect in this model allows the teacher to develop a deep understanding students’ needs and how they learn. We at MEDILAB are convinced that hands-on learning should be an integral part of the sciences’ curricula at all grade levels. We promote new concepts in teaching and in the integration of Science, Technology, Engineering and Mathematics (STEM) into all stages of education and research. Science, Engineering and Mathematics play an essential part in the formation of well rounded and perceptive students and are complemented by technology, which provides students with the creativity and innovation required to solve problems and apply what they learn to everyday situations. Introducing technology in scientific learning at the early stages of elementary learning facilitates pupils’ transitions into intermediate and secondary level science and experimentation. MEDILAB has been the pioneer in supplying sensors, probes, interfaces and software to intermediate and secondary level educational institutions. These tools simplify the data collection process and allow learners to develop intuitive predicting and analyzing capabilities. تدعم المنصّة تلاميذ الصّفّ الرّابع أساسيّ حتّى الثّاني عشر لتعلّمٍ تفاعليّ وتحفيزيّ ومُشَخصَن. وهي مصدر غنيّ بالموارد التّعليميّة يستفيد منه معلّمو اللّغة العربيّة عبر مكتبة رقميّة ترافق نصوصها أسئلةٌ هادفة تحاذي مناهج التّعليم المحلّيّة والعالميّة، بالإضافة إلى دروس جاهزة في التّعبير الكتابيّ ومعايير تصحيح منهجيّة وتقارير ترصد أداء المتعلّمين بدقّةٍ لا مثيل لها. Mubakkir is an easy-to-use app for teachers to quickly know where gaps are in a student's early Arabic literacy skills development. It includes 3-4 years worth of micro-assessments, each of which only takes a minute to administer, creating a running record of progress with audio and visual evidence gathered in a valid and reliable data set. First ever online app and dashboards for teachers, administrators, and researchers was released in January 2018 and already in use by public and private schools across the Middle East. In this session, we will explore what each of these management concepts means, how to be effective at them, and why we should all strive to be transformational leaders. Participants will walk away with their very own examples on how to introduce change that leads to them being transformational leaders in life and at work. Mathematics teachers ask questions of their students all the time. Often, they expect short answers and give very little time for students to answer. This session will be based on extensive work with teachers and students trying to develop strategies for more effective questioning. Good questions will probe student understanding and enable teachers to assess their progress. This session is based on work with mathematics teachers, but we hope will also be of interest to teachers of science. In this session the presenters will present a variety of reading and writing activities designed to work in any language classroom, from introductory to advanced. Audience members will walk away with a packet of hands-on activities, which target a variety of skill levels and learning styles within their classrooms. During the presentation, audience members will have the opportunity to experience the activities in a classroom-simulated environment. Activities will include word storms, text explosions, and found poems, among others. In a rapidly changing, interconnected and interdependent world how can students be involved in action for change? In this session, participants will explore action in the PYP and different dimensions of global citizenship. They will be provided with resources and examples of how to take action forward in their context. Gone are the days of "one-size-fits-all" teaching. • How to use the free tool, ScreenCastify, to record on-screen lessons that students can access anytime, anywhere. • How to use screencasts to individualize instruction, personalize learning and improve students’ achievement. By the end of the session, the participants will have a working knowledge of the basic principles of Bloom’s taxonomy and the way it can be used for teaching English to young learners and adults. The participants will have the opportunity to assess lesson pages from several course books and adapt them so that their students travel through all knowledge dimensions and achieve more. A huge range of free web tools and cheap devices are now available to support learning in the classroom and from home. This workshop will introduce teachers to a range of free tools and resources to engage students, assess learning, and to develop their knowledge and skills. ِAn overview of Edraak’s K-12 platform which offers high quality open educational resources (OERs) in Arabic targeting K-12 students and their educators across the Arab world. The platform enables learners to access sequential learning material, as well as student-centered inquiry based learning that allows them to search for concepts without having to enroll in a predefined learning sequence. Recognizing the importance of teachers in the learning process, the platform also provides key resources for use in the classroom and will eventually align with national curricula. Edraak’s K-12 platform, launched in collaboration with Google.org, offers a flexible learning tool that combines advanced technology and high quality content. Starting with the mathematics curriculum for all grades, the platform will gradually expand to include other core subjects by 2020. To ensure equitable access to its offerings, the platform will eventually include offline functionality and support. جلسة تعريفية بمنصة إدراك للتعلم المدرسي التي تم إطلاقها في بداية عام 2018 من خلال تعاون مع مؤسسة جوجل دوت أورغ ، والتي تقدم موارد تعليمية مفتوحة المصادر باللغة العربية مخصصة لطلبة المدارس والمعلمين في المنطقة العربية. تجمع منصة إدراك للتعلم المدرسي ما بين التّكنولوجيا المتقدمة والمحتوى التّعليميّ من خلال برنامج (K-12) الذي يوفر مواد تعليمية مجانية عالية الجودة باللغة العربية تحاكي المناهج المدرسية من رياض الأطفال وحتى الصف الثاني عشر في الوطن العربي. وتوفر المنصة خصائص مميزة تساعد الطلبة على الحصول على تجربة تعلّمية متميزة تمكنهم من البحث عن المفاهيم الواجب تعلمها في المدرسة ودراسة المناهج المدرسية بشكل تفاعلي متسلسل وبجودة عالية. وبدأت المنصة منذ بداية هذا العام بتوفير مادة الرياضيات لجميع الصفوف، وستستمر بالتوسع في المواد الأساسية الأخرى بحلول عام 2020. وتماشياً مع رؤية إدراك في توفير فرص متساوية للطلبة فسيكون بإمكانهم الاستفادة من المواد المطروحة دون الحاجة لاستخدام إنترنت من خلال الدعم الذي ستوفره إدراك العام القادم. In this session the presenter will take you through her journey of facing challenges, taking people out of their comfort zones, making a significant difference in their lives and leading by example in a school community. The session will be focused on transferability of skills from the DP to life beyond the programme. It will stem from the continuum between MYP to DP core components and subject groups. approaches to teaching and transfer skills from DP core and subjects to life beyond the programme. This session will demonstrate an approach, using observation and interview, to focus on and understand better the relationship between teachers and pupils. Importantly it will highlight how this insight can help teachers better understand the experiences of their pupils and how these experiences shape their engagement with learning. There will be plenty of opportunity to try the techniques and participants will be given the tools to take away and try in their own classrooms. • Understand the relationship between the questions teachers ask and the thinking that students develop. • Be able to use the TIEL Curriculum Design Model (Teaching for Intellectual and Emotional Learning) to design questions for lessons in their disciplines that help students develop thinking and social emotional processes. Purposeful questions help students develop a wide range of thinking processes as well as positive social emotional characteristics. Do our questions lead to these outcomes as much as we would like? The TIEL Curriculum Design model helps teachers structure questions that insure the development of thinking skills and qualities of character in your daily lessons. By the end of this session, participants will be able to explain what cooperative learning is, differentiate between group work and cooperative learning, and implement a number of cooperative learning strategies in their own classrooms. In this session, participants will first learn briefly about the background of what cooperative learning is and how it can positively impact students’ engagement, relationships, and achievement in the classroom. Next, the presentation will explain the difference between traditional group work and cooperative learning. Lastly and most importantly, the session will explain and model a number of different cooperative learning strategies that teachers can use in their own classrooms, regardless of which subject or grade level they teach. We will look at how international mindedness is developed through an IB education. We will look at how international-mindedness is expressed across different contexts. • An analysis of how international mindedness permeates the philosophy, culture and curriculum of the IB continuum of education. • An opportunity for participants to reflect on how international mindedness is expressed in their context. An Early Years teacher is an observer par excellence. This session will engage the participants in a professional discussion and reflection about the importance of observation as a tool for assessment in the Early Years classes. During the workshop, participants will learn about the different types of observations, their objectives and how they can be used for different purposes depending on the goal of the teacher. Participants will learn about narrative and authentic observation, the most widely used assessment tool in the Early Years classrooms. Participants will be aware that at the end of the three courses of teaching English through songs, movies, and plays, and specially playing a role in front of audience- learners are supposed to be confident enough to use English in real life. 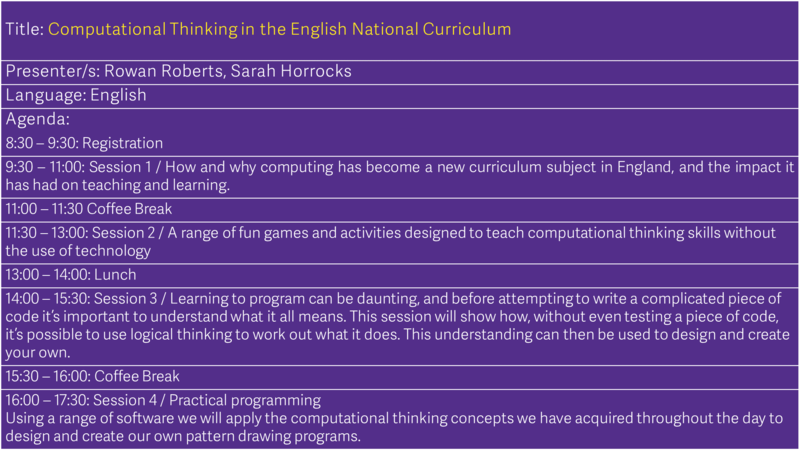 The session will include a range of classroom-ready activities which can be used to support children’s computational thinking as part of a ‘coding’ computer science curriculum and across all subject areas. This session is aimed at elementary and middle school teachers. • Understand and model good digital citizenship. • Address real challenges to help schools navigate cyberbullying, internet safety, and other digital dilemmas. • Create a positive school culture that supports safe and responsible technology use. Media and technology are at the very center of all our lives today- especially our children’s. The media content children consume and create has a profound impact on their social, emotional, and physical development. Learning how to use media and technology wisely is an essential skill for life and learning in the 21st century. This session is for teachers who want to help raise and develop a generation of kids who think critically, act responsibly, and interact positively in the digital world. In this session the presenter will discuss the importance of assessments in the learning process and distinguish the different forms and functions of assessments and interpretation of the assessments outcomes. 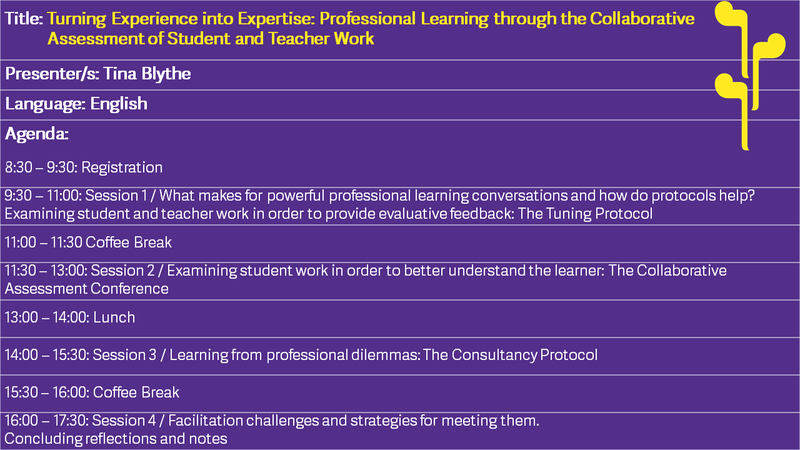 The session will cover how to give meaningful feedback to learners , the use of assessment to reflect on teaching strategies, the importance of assessment in the wellbeing of the learner and helping them grow as independent reflective lifelong learners. This session will enable participants to understand the necessity to explicitly and implicitly teach ATL skills and will introduce them to processes to facilitate the design of relevant learning experiences which support regulated learning. 1-Discuss the necessity for teachers to teach ATL skills to develop life long learners. 2-Explore the roles of cognitive, affective and metacognitive skills. Are you interested in becoming an IB World School? Would you like to know more about the IB philosophy and how this ethos permeates IB schools? Are you looking at improving teaching and learning at your school? If so, then you may want to attend this session to learn more about what it takes to become an IB World School. • Find out how to apply to become an IB World School and what the requirements are. In this session the participants will investigate why learners are motivated or demotivated towards learning through raising awareness on the role of emotions for understanding learners and the learning environment. It also explains the biological experience and gender differences of emotions. Participants will better understand learning and learners through connecting learning to life. Positive memories direct positive behaviors toward learning (Lawson).Thus, our thoughts influence how we feel when we colour our interaction with learning. Let's Make our learning visible…. The purpose of this workshop is to enhance participants understanding of the importance of applying visible learning strategies and tools inside the classroom. An emphasis will be placed on defining visible learning and its effect on deepening students learning. Participants will be introduced to how to apply different visible learning methods and sharing the presenters' experience. They will have tools and strategies to take with them into their classrooms. 3. be encouraged to take charge of their learning and development through digital teacher communities that allow for sharing of ideas and increased collaboration. In the 21st century, using technology is crucial to fully engage learners both in and outside the classroom. At the same time, we are encouraged to critically evaluate if technology really adds value to the classroom and helps us do things that would be impossible otherwise (Corder, 1996). In this workshop, we will endeavour to discuss solutions to the challenges and demonstrate how teachers can use a range of popular, free and user-friendly tools such as WhatsApp, Zoom and so on to foster collaboration between students and teachers. Together we will reflect on how we can promote autonomous learning for our own students using modern digital devices available to us. This session aims at developing participants’ understanding of Marzano’s six-step process and utilizing it in teaching vocabulary. Marzano’s six-step process is the latest and most effective strategy of teaching vocabulary for all grade levels where students are actively engaged in learning new terms. With Marzano’s dynamic approach, students will not only have fun, but also will have the opportunity to review difficult terms through multiple exposures in a non-threatening way. Language Experience Approach is a research-based approach that is developmentally appropriate for young learners. This session aims at helping participants in using the Language Experience Approach to boost their young learners’ English in all four language domains through learning how to design experiences for all levels of students that spark engaging conversations and become the basis for co-created texts. Participants will collaboratively brainstorm a variety of literacy extensions, including targeted grammar and vocabulary lessons, that move learners through the Zone of Proximal Development.